So, I've lived the last almost 2 years having to use 2 phones. A work phone that's an iPhone and then my personal (which has varied). 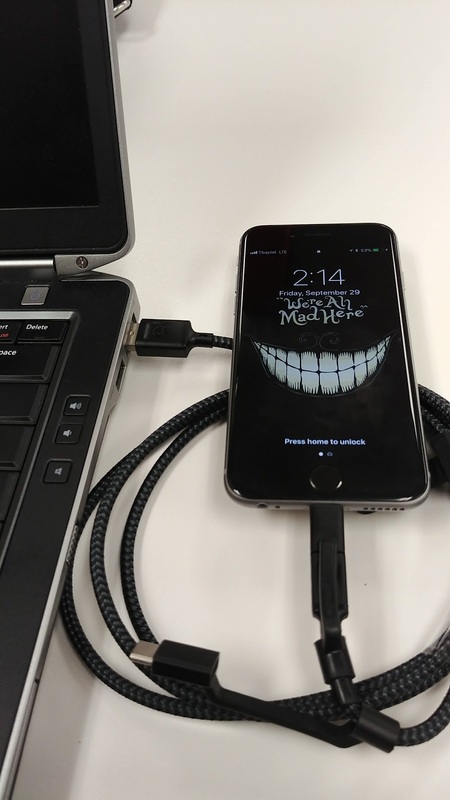 Whether I had Moto Z with USB-C or a Samsung Galaxy S7 with microUSB it still meant I had to have 2 cables with me to charge up either device. In my car, I used to have a cable for microUSB, a cable for lightning and then an adapter for USB-C. Depending on what I wanted to have charged I would have to find the cable/adapter appropriately. It sucked. 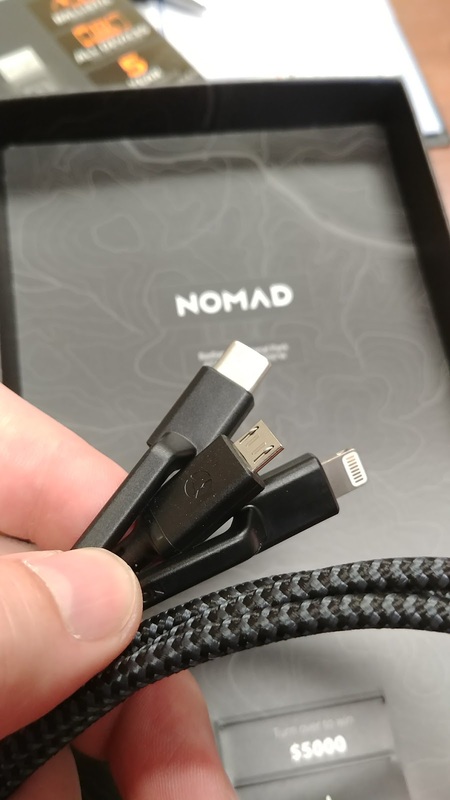 Then, thankfully, Nomad came up with a cable that has all the right plug adapters on the one cable. Phew. This is their 'ultra rugged' universal cable. It can come in either 1.5M (as shown below) or just 30cm. Whatever works for your scenario. For me, I've always never took much stock in the 'it's not the size that matters' saying and go for the bigger. Easiest to have it and not need it, than not have it and need it. Plus, if you get the longer cable, there's a nice cable keeper with it to keep it nicely and neatly coiled. Now, the cable itself has a USB-A on one end to plug into the USB port of ... well, whatever. 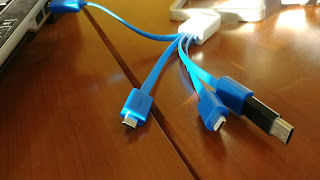 The other end has a microUSB connector, but then 2 attached adapters for USB-C or lightning. 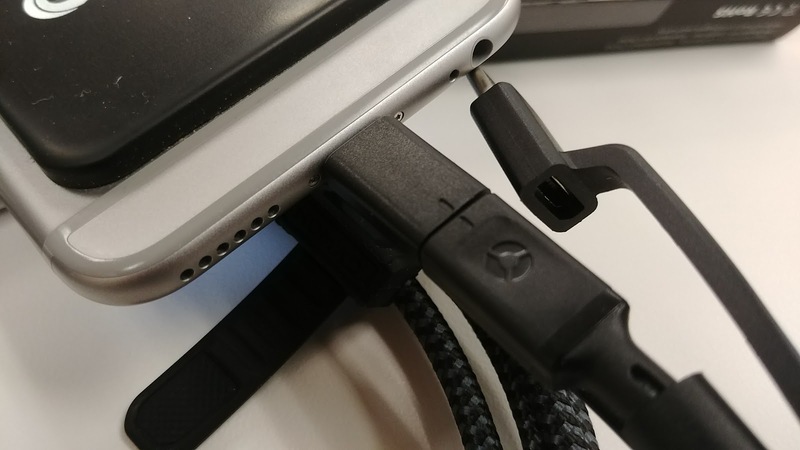 The trick here is that to get the adapter on to the end you have to remember that microUSB has an up/down side, so orienting the adapter piece properly takes some getting used to (they have little notches on it that you line up to ensure it's the right way. The other thing that I think was kind of a missed point was that if I want to switch from lightning to USB-C, I unplug the connector, and then have to twist the adapters around 180 so the other connector goes on. 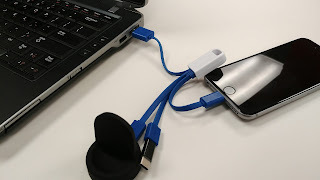 Might have just been easier to leave the orientation of the plug the other way around for the other connector so you wouldn't have to twist (and instead of a notch to line up, you have a top half and bottom half of a C or a lightning bolt) it around. They could be fixed... anyways, I'm not in product design, I'm sure there's a reason for that. Anyhow, you end up reducing clutter. Which looks better? Sure, I can now only charge my iPhone, or my personal device, or my watch dock. But it looks cleaner on my desk now and that's important. Rarely do I have to charge multiple items at the same time. The cable works reliably after 10,000 multi-directional 150 degree flexes at the micro USB connector. Good to know. My son is always holding whatever cable is plugged into his phone on his bed so it's almost bending backwards and the connector usually gives way and then I have to replace it. At $35USD some may say that it's a pretty expensive cable. But for someone like me, having to get 3 different cables, or a cable and 2 extra adapters and pray to god I don't lose them ... this is very handy. Plus it's a cable I know I can give to my son and it won't get ruined (as easily). There is a 5 year guarantee.. now whether that would cover for damage (like my son's) or not, is not clear. Still, worth it if you want a cable to last.